I was asked to fix a computer for one of my wife's friends who had a computer running Windows Vista. The problem with the computer was that when she opened Internet Explorer it would attempt to show a dozen other Internet Explorer windows and each Windows tried to load a dodgy web page. In addition to the multiple windows, the browser would also not allow the lady to visit certain web pages such as Facebook and Twitter. When I booted into the system for the first time I wasn't surprised to find a dozen or so icons for programs such as Windows Optimiser and iSearch. It was clear that this computer was full to the brim with Malware. The really big clue if one was the "Install Internet Explorer" icon on the desktop. Normally in these situations, I prefer to go for the blitz and reinstall the operating system. I find that it is the only way you can be fully sure the system is clean. Unfortunately, the computer didn't have any disks or any restore partitions. I called my wife's friend and told her that I could either spend hours trying to clean the machine with no guarantee that I would get the desired end result (for all I knew Internet Explorer had been completely compromised), I could hand the machine back for her to get fixed by somebody who had a Windows Vista disk, she could buy a new computer or I could install Linux on the computer. I spent about 30 minutes explaining that Linux isn't Windows and that some things worked in a different way. I also listened to what her general requirements for the computer were. Basically, the computer was mainly used for browsing the web and writing the odd letter. Her requirements could more than be met by most Linux distributions. The next step was about deciding on a distribution. To work out what to install I first had a look at the hardware. The computer was an Acer Aspire 5720 with a dual core 2 GHz and 2 gigabytes RAM. It wasn't a bad machine in its day but its day has passed somewhat. I, therefore, wanted something fairly lightweight but not too lightweight because it isn't ancient. Based on the fact that the lady is a fairly basic user I wanted to get a distribution that was a lot like Windows to make the learning curve as small as possible. If you check out this article about choosing the best Linux distribution you will see a list of the top 25 distributions as listed on Distrowatch. A number of the distributions on that list would have been suitable but I was also looking for a distribution that had a 32-bit version. 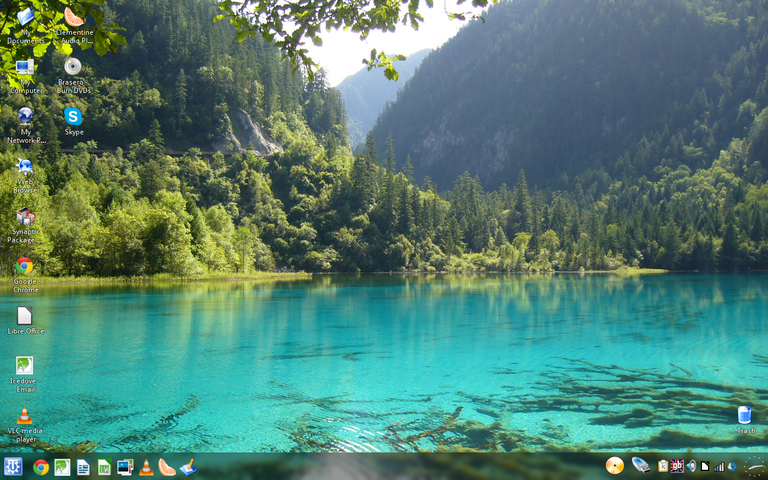 From the list I could reasonably have gone for PCLinuxOS, Linux Mint XFCE, Zorin OS Lite or Linux Lite but having recently reviewed Q4OS I decided that this was the best option because it looks a lot like older versions of Windows, it is lightweight, fast and easy to use. Reasons for choosing Q4OS included the older Windows look and feel with everything down to icons for My Documents and My Network Places and a trash can, a small initial download with options for installing multimedia codecs and a good selection of initial desktop applications. The Q4OS Linux distribution has different profiles for different uses. The initial install comes with a basic set of KDE desktop applications. If I didn't like the applications that came with the fully featured desktop I would have gone for keeping Q4OS as it was and installing the applications separately but by installing the fully featured desktop I was given Google's Chrome browser, the LibreOffice office suite complete with Word Processor, Spreadsheet package, and Presentation tool, the Shotwell photo manager, and VLC media player. That solved a number of selection choices straight away. Trying to explain to somebody the virtues of not using Flash probably isn't going to be overly welcome when they can currently do it with Windows (albeit in this case the lady couldn't because it is full of malware). I, therefore, wanted to make sure that Flash was installed, VLC could play all media files and MP3 audio would play without any hassle. Fortunately, Q4OS has an option for installing all multimedia codecs on the initial welcome screen. Problem solved. If you read my guide listing the best and worst Linux web browsers you would know that I think only one browser really does the job and that is Google Chrome. The reason for this is that only Google Chrome has its own Flash player embedded and only Chrome supports Netflix. Again your average Windows user doesn't care about the merits of other browsers if they can't get done what they can get done under Windows. I have recently written another guide which lists the best and worst Linux email clients. I personally believe that the best email client for Windows users would be Evolution because it looks and behaves a lot like Microsoft Outlook. However, I decided that as this was a KDE based distribution to go for Ice Dove which is a Debian branded version of Thunderbird. Thunderbird was number 2 on the list of best and worst email clients and as an email client is perfect for most peoples needs, especially when it comes to home use. Nearly every distribution has the LibreOffice suite as the set of office tools installed by default. Other solutions were perhaps Open Office or KingSoft. Now I know Windows users generally complain that the one application they really need is Microsoft Office but when it comes to home use this is plain nonsense. If you are using a word processor such as Microsoft Word the most you are likely to be doing is writing a letter, a report, maybe a newsletter for a local group, a poster perhaps, maybe a brochure, perhaps you are writing a book. All of these things can be accomplished in LibreOffice Writer. There are some features missing in LibreOffice for sure and compatibility isn't at 100% when it comes to exporting to Word format but for general home use, LibreOffice writer is fine. Spreadsheets are used at home for really basic things like home budgets, maybe a bit of basic accounting or a list of some kind. The only real decision I had to make was that the lady admitted that she was used to using Open Office. So I had to decide whether to go for Open Office or switch her to LibreOffice. I went for the latter. There really is only one Linux video player that needs to be mentioned. Most people use this for Windows as well because it is so good. The VLC media player can play DVDs, lots of different file formats and network streams. It has a simple but clean interface. It wasn't hard to find an audio player that beat Windows Media Player. What I did want to do though was choose something that had basic iPod support. I don't know for sure that the lady has an iPod but I wanted to cover some bases. I wanted to go for a KDE specific audio player which narrowed the choice to Amarok and Clementine. There isn't much between the two when it comes to features and so much of the decision was down to personal choice. Hopefully, she likes my taste because I prefer Clementine over Amarok. Q4OS installed Shotwell by default and it is generally the photo manager installed by many of the top Linux distributions. I decided not to change this. The GIMP is a well-known Linux image editor along the lines of Photoshop but I think that for the end user's requirements it would have been too much. I, therefore, decided to go for Pinta which is a Microsoft Paint type clone. I have no idea whether the end user uses Skype but I wanted to make sure it was installed rather than making the lady search for it herself. Again, I have no idea whether the lady creates DVDs but it is better to have one installed than not. Q4OS has the choice of a basic menu that looks much like the Windows menus of yesteryear or a Kickstart menu which has a search tool and a more modern interface. Whilst the old school menu system might be more convoluted I decided to stick with it as it is very easy to navigate. I also decided to add a set of icons to the quick launch bar. I removed the Konqueror icon and replaced it with Google Chrome. I then added Thunderbird, LibreOffice Writer, Calc and Presentation, VLC, Clementine, and a shortcut to the desktop. To make it even easier to use, so that the user doesn't have to try and traverse the menus too much I added icons onto the desktop for all the applications that I installed. My main concern with the setup is the package manager. Windows users aren't overly aware of the concept of package managers. The one installed with Q4OS is Synaptic which whilst easy for most Linux users may be a bit complicated for basic Windows users. The other concern I had was with regards to hardware. The user never mentioned a printer but I have to assume she has one because he uses a word processor. Q4OS didn't have any problems connecting to my Epson wireless printer but then that is probably because it is quite modern. My wife's friend is now in possession of a computer that works, is virus free and fulfills all of the tasks she mentioned when I spoke to her on the telephone. Another user successfully converted to Linux.